1Department of Pharmacology, School of Pharmaceutical Sciences Shoolini University Solan, Himachal Pradesh 173229, INDIA. 2Indian Institute of Integrative Medicine (CSIR), Jammu 180001, Jammu and Kashmir, INDIA. Background: The lack of vaccines and limitations of currently available strategies demand a need to develop safe and efficacious immunomodulators. Phyllostachys bambusoides is traditionally used for various autoimmune and infectious disorders, a property possibly attributable to presence of flavonoids like orientin and iso-orientin. Objective: the objective of this study was, to search a potent immunomodulator which elicit both Th1 and Th2 immune response. Methods: The animals were (Balb/c) treated with the bioactive fraction (PBC) from P. bambusoides (100 and 200 mg/kg body weight) for 14 days with SRBC (Sheep Red Blood Cells) as an antigen. Haemagglutination antibody (HA) titre, delayed type hypersensitivity (DTH) reaction, phagocytic index, NO production, analysis of cytokines in serum and CD80/ CD86 population in spleen. 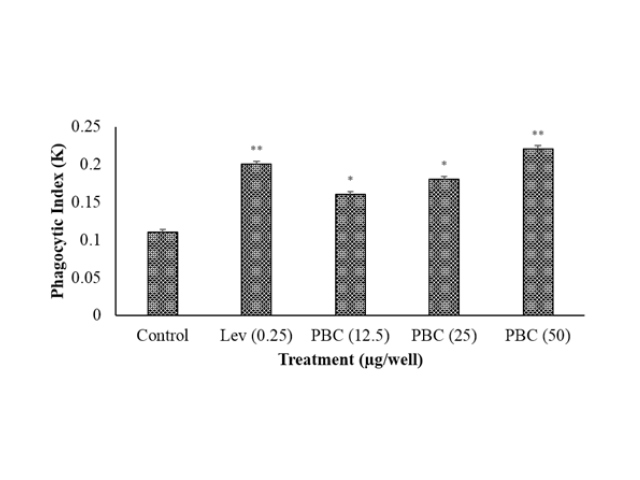 Results: PBC significantly enhanced the expression of IgM and IgG titre and DTH response in a dose dependant manner after 24 and 48 h in BALB/c mice with a maximum response at 200 mg/Kg. Besides humoral and cell mediated immunity, it also enhanced phagocytic index, nitric oxide production, which further leads to protection against Candida albicans infection. It also, enhanced the expression of CD80 and CD86 in splenic cells. Conclusion: Taken together these in vitro and in vivo data, our results suggest that PBC acts as an effective immunostimulator which specially enhances macrophage function during infection. This further supports the role of PBC in immunopharmacologic applications. Kumar S, Sharma G, Kumar A. Immunomodulatory Activity of Bioactive Fraction (PBC) from Phyllostachys bambusoides. Pharmacognosy Journal. 2017;9(6):786-791.